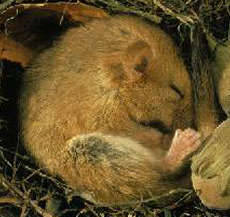 The word dormouse comes from the French word 'dormir' - to sleep. The dormouse is one of the most attractive of Britain's small mammals. Distribution: found mainly in southern counties from Cornwall to Kent northwards to Herefordshire and into Wales. They are occasionally recorded in the north but not found in Scotland. Habitat: deciduous woodland with plenty of scrub and undergrowth resulting from coppicing (cutting trees and woody shrubs to ground level periodically to provide wood for various purposes). Description: chubby build; bright golden-brown colour with creamy-white underparts. Large, prominent, shiny, black eyes and small, rounded ears. Fluffy tail. Size: head and body about 70mm (2in); tail of similar length. Adult weighs about 17g (weight of two £1 coins) and up to 40g at the start of hibernation. Life-span: up to 5 years in the wild; 6 years in captivity. Food: flowers, pollen, fruit, nuts and insects. Hazel, honeysuckle, bramble and oak are particularly important as food sources. The word dormouse comes from the French word 'dormir' - to sleep. The dormouse is one of the most attractive of Britain's small mammals. It is a member of the rodent family which means it has prominent, strong and sharp front teeth (the incisors) for gnawing food. Around 100 years ago, dormice were more widespread and often kept as pets in the countryside. They were made famous through the Mad Hatter's tea-party from Alice in Wonderland. Unfortunately, today they are a rare and endangered species and few people are lucky enough to see one in the wild.